Like most of his statements that aren't about condoms, B16's prayer intention for December largely lacked the attention it deserves, especially given its worthwhile call amid the clamor of this time of year for solidarity with those most in need of the light, joy, healing and hope of Christmas. Anyone who's ever spent Christmas Eve in a shelter, hospital or a nursing home knows the degree to which the loneliness, longing and despair you'll often find over those hours tends to make the feeling in many rooms and hallways seem far closer to the moment of Christ's death than that of his birth. So to help buoy up spirits, earlier today the Holy See announced that the pontiff will be undertaking two outreaches during the Christmas season to "encounter the world of the marginalized and suffering" in Rome -- and, in the process, prodding the rest of the church to follow suit at home. 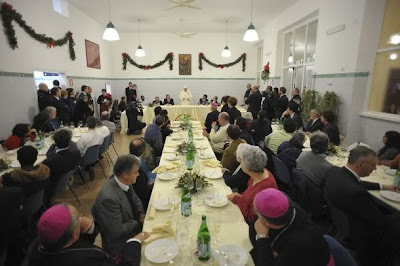 On the 26th, Benedict will host the poor served by the city's houses of the Missionaries of Charity for a lunch in the atrium of the Paul VI Hall -- the same place where, just over recent months, he's held meals for the College of Cardinals and the Synod of Bishops. The likes of a Vatican pranzo of this sort unable to be recalled in memory, the lunch will form part of the Holy See's commemoration of the centenary of the birth of the community's foundress, Blessed Teresa of Calcutta. 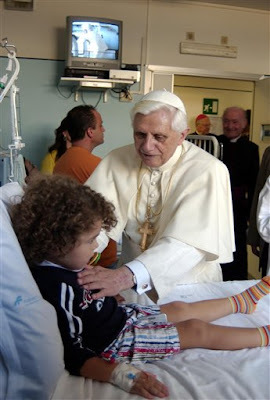 Then, on 5 January -- the day before the traditional observance of Epiphany -- the Pope will head to the pediatric ward of the Gemelli Polyclinic (the hospital used by the pontiffs), where he'll deliver gifts to the young patients after blessing a new unit for kids afflicted with spina bifida. Indeed, church, the temptation to put it at an arm's length it is all too easy to come by... but for Christians, the truth remains that any attempt at celebrating these days that fails to carry their gifts to the suffering and downcast -- physically, emotionally, materially, and beyond -- makes Christmas ring even more hollow than does its exploitation at the cash-registers and in the shop windows. The Word became flesh, after all, to accomplish up close what he couldn't from beyond. And if that was the case for God Himself... complete the sentence. At lunch I was able to learn a little of some of your stories that reflect current human situations. I heard of sorrowful events full of humanity and also stories of love rediscovered here at Sant'Egidio: the experiences of elderly, homeless or disabled people, emigrants, gypsies, individuals with financial problems or other difficulties who are all, in one way or another, sorely tried by life. I am here with you to tell you that I am close to you and love you, and that you and your struggles are not far from my thoughts but rather at the center and in the heart of the Community of believers, hence also in my heart. Through the loving actions of those who follow Jesus, the truth becomes visible: that "(God) has loved us first and he continues to do so; we too, then, can respond with love" (Deus Caritas Est, n. 17). Jesus said: "I was hungry and you gave me food, I was thirsty and you gave me drink, I was a stranger and you welcomed me, I was naked and you clothed me, I was sick and you visited me, I was in prison and you came to me" (Mt 25: 35-36). And he concludes: "as you did it to one of the least of these my brethren, you did it to me" (v. 40). Listening to these words, how is it possible not to feel truly friends of those in whom one recognizes the Lord? And not only friends but also family. I have come to you precisely on the Feast of the Holy Family because, in a certain way, you resemble it. In fact, the Family of Jesus, from his very first steps, encountered difficulties: it experienced the hardship of finding no hospitality and was forced by King Herod's violence to emigrate to Egypt. You know well what difficulty means, but here you have someone who loves and helps you, indeed, some of you have found your family thanks to the caring service of the Community here, which offers a sign of God's love for the poor. What happens at home is taking place here today: those who serve and help mingle with those who are helped and served, and those in greatest need are given priority. The words of the Psalm spring to mind: "Behold, how good and pleasant it is when brothers dwell in unity!" (Ps 133 : 1). The commitment to making those who are lonely or in need feel at home, so laudably practised by the Community of Sant'Egidio, is born from attentive listening to the Word of God and from prayer. I would like to encourage everyone to persevere on this journey of faith. With the words of St John Chrysostom I would like to remind each one: "Consider you have become a priest of Christ, giving with your own hand not flesh but bread, and not Blood, but a cup of water" (Homily on the Gospel of Matthew, 42,3). What riches are offered to life by God's love expressed in real service to our brothers and sisters who are in need! Like St Lawrence, a Deacon of the Church of Rome, when the Roman magistrates of the time sought to intimidate him, to make him handover the Church's treasure, he pointed to the poor of Rome as the true treasure of the Church. We can make St Lawrence's gesture our own and say that you, the poor, really are the Church's treasure. Loving and serving give the joy of the Lord who says to us: "It is more blessed to give than to receive" (Acts 20:35). In this time of particular financial difficulty, may each person be a sign of hope and a witness of a new world for those who, locked into their own selfishness and deluded into thinking they can be happy alone, live in sadness or in transient joy that leaves the heart empty. A few days have passed since Holy Christmas: God made himself a Child, he made himself close to us to tell us that he loves us and needs our love. With affection, I wish everyone happy feast days and the joy of feeling God's love ever more deeply. I invoke upon you the protection of the Virgin of the Visitation, the one who teaches us to go "in haste" to meet the needs of the brethren, and I bless you all with affection.